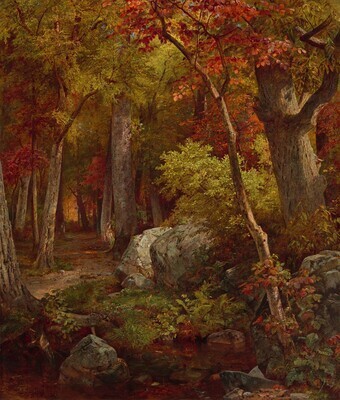 Richards' early work as a landscape painter was strongly influenced by the paintings of the Hudson River School, which was at that time in its most active and creative phase. These works followed the school's well-established formulas for depicting expanses of rural and wild scenery in a romanticized and stylized manner. In 1858, Richards saw an exhibition of English Pre-Raphaelite paintings in Philadelphia. These works displayed a hyperrealistic style, brilliant coloring, and often addressed subjects pertaining to history, literature, religion, or modern society. Under the influence of the Pre-Raphaelites, Richard's landscape style changed dramatically, becoming more meticulous and precise. He abandoned the panoramic compositions he had favored earlier for more closely focused views of forest interiors with highly detailed foregrounds.October is of impressive scale for this period of his work, a marvel of careful observation and scrupulous portrayal reflecting the influence of the Pre-Raphaelite painters. The foreground, with its lovingly detailed rocks and plants, is overarched by trees resplendent with autumn foliage. In the distance, the forms of the forest dissolve in a radiant display of color and light, animated by small specks of blue sky revealed amidst the leaves. The same year he painted October, Richards was elected a member of the Association for the Advancement of Truth in Art, a group of American Pre-Raphaelite followers who similarly sought spiritual truths through a diligent and detailed study of nature. Although this movement was relatively short-lived, lasting less than a decade, it resulted in a number of exceptional landscape and still life works by artists including Richards, Thomas Charles Farrer, and John Williams Hill. While Richards's Pre-Raphaelite paintings are considered by many to be his finest accomplishment, they are few in number. After 1867, the artist turned his attention to marine subjects, producing seascapes executed with an eye more focused on atmosphere and drama than exacting fidelity to nature. Probably Marshall O. Roberts [1814-1880], New York, by 1864; probably (his estate sale, Fifth Avenue Art Galleries, New York, 19-21 January 1897, 1st day, no. 129). private collection, Los Angeles; (Scott Anderson, Los Angeles); sold 2000 to Mr. and Mrs. Howard Godel, Bedford, New York; sold 10 March 2003 to NGA. Roberts' self-made wealth came from various government contracts that relied on his interests in steamers and railroads. Long a patron of the fine arts, he gathered a collection of over three hundred paintings that he opened to the public free of charge. A number of things point to the probability that Roberts owned the NGA painting. A review of the exhibition at the Artists' Fund Society in Philadelphia early in 1864 that seems to describe the NGA painting indicates that several of the paintings would "in a few days . . . be sent to their New York possessors," but unfortunately none are specified ("Art in Philadelphia," The Daily Evening Bulletin [Philadelphia, 21 January 1864]: 8:1). Roberts certainly owned a painting with the same title by the spring of that year; number 80 in the catalogue of the 1864 Art Exhibition at the Metropolitan Fair in Aid of the U.S. Sanitary Commission was "October, 1863," lent by M.O. Roberts. The painting was mentioned by title in a review of the exhibition, but it was "hung too high to be studied" and there is no clear description given ("Exhibition of Pictures at the Sanitary Fair," New-York Daily Tribune [16 April 1864]: 12; both newspaper articles supplied by Merl M. Moore, Jr.). The fifty-two stereograph views of the exhibition held by the New York Historical Society were reviewed (Collection Box 43, PR 065-0500), but in the views that feature paintings the works are either too small or not clear enough to be identified (memo of 23 May 2003, Charlie Brock to Franklin Kelly, NGA Dept. of American and British Paintings). The only Richards painting in the 1897 estate sale catalogue is "October," with dimensions given as 23 1/2 x 28, which are very close to those of the NGA painting. See e-mail message of 2 September 2003 from Godel & Co. to Franklin Kelly, copy in NGA curatorial files. Probably Art Exhibition at the Metropolitan Fair in Aid of the U.S. Sanitary Commission, New York, 1864, no. 80. Probably Artist's Fund Society, Philadelphia, 1864. Asher B. Durand: "Kindred Spirits". Exh. brochure, National Gallery of Art, Washington, 2005: fig. 5. Moore, Charlotte Emans. "Art as Text, War as Context: The Art Gallery of the Metropolitan Fair, New York City's Artistic Community, and the Civil War." Ph.D. diss. Boston University, 2009: xxv, 489, 496, 689, fig. 6-62.